These days when email marketing is far from being dead, it is simply impossible to maintain the “inbox zero”. Nowadays even Gmail does email sorting job for you and allows you to have five tabs. This means only one thing – most of your recipients are overwhelmed by the number of emails they get. In this email flood, your message can be easily lost in the inbox or simply ignored. So, how can you make your emails stand out, be read and responded to? Recipients of your email evaluate the importance of your email by the subject line. That’s why it is important to keep your subject line specific. 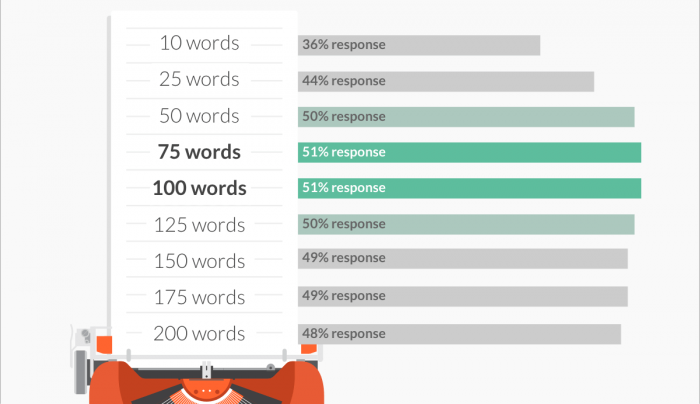 The Boomerang study shows that the shorter the subject line is the higher the probability to get a reply. The ideal length turned out to be 3 to 4 words. However, this is contradicted by the Yesware data. They believe that the length of the subject line doesn’t influence anything. It might be a good idea for testing. Also, questions in the subject line considerably increase the probability of getting a response. 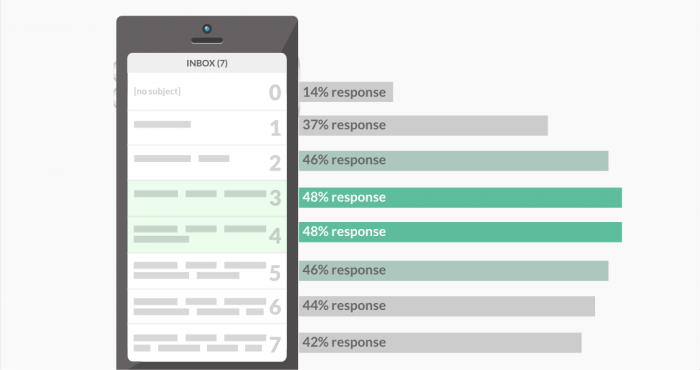 Your recipients are a bit too busy to read, so don’t make your copy too long and optimize it for the read on the go. Be concise, use bulleted lists and divide the message in easily digestible chunks. Some even say that Twitter message length (140 characters) is ideal for emails. However, Boomerang study says that the ideal length is 75-100 words. Another thing here is that you should not write in overcomplicated language. 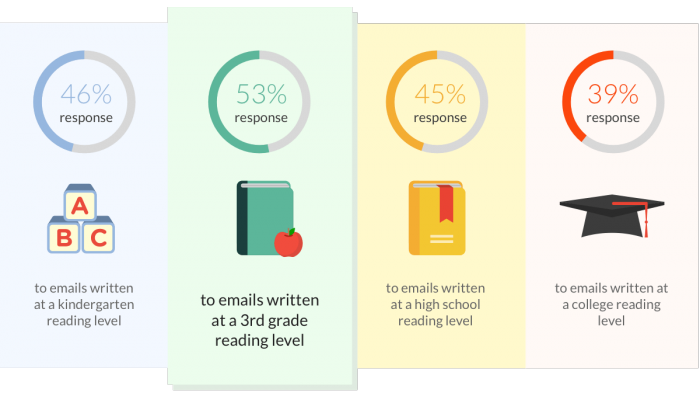 Boomerang observations say that 3rd grade reading level language gets the highest rate of response – 53%. Of course, it all depends on the context. The messages written in this kind of 3rd grade reading level English will be completely inappropriate in the academia. Personalization is a proven way to increase open rates. But using your recipient’s name in the subject line or in the opening is not enough. You really have to know what appeals to your recipients because they are not the same: they are in different buying and customer lifecycle stages. It is recommended to address your emails to a specific group of people that you need action from, and to send emails from a real person. 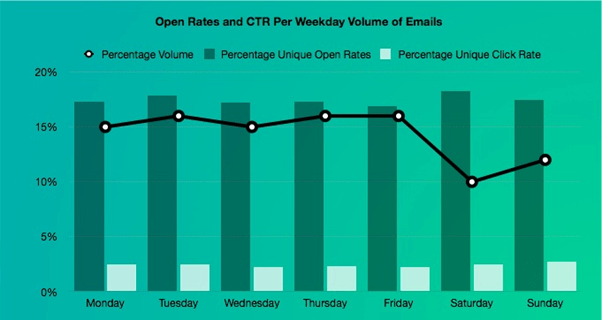 It might be a good idea to send your emails on Tuesday or over the weekend, because the Cutomer.io data shows that these days have the highest open rates. Also, Yesware data backs up the weekend theory, as according to it the highest reply rate is seen over the weekend. It might be because there is less competition. Concerning the time of the day, a lot of studies recommend to send emails during the business hours when people actually check their emails. 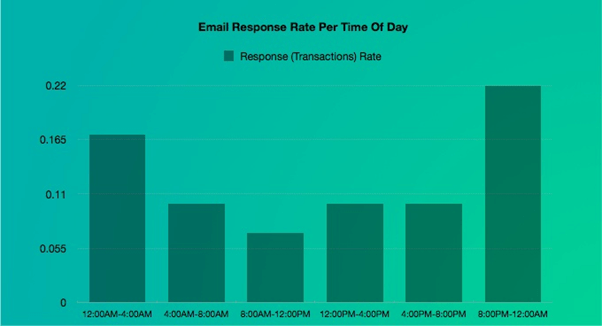 Surprisingly, emails sent in the early morning and evening have the highest reply rates. Maybe it is because during the day people can get overloaded by other emails or tasks and forget to answer. You must address time factor in your emails. Highlight all deadlines and times constraints in your email. Urgency is a natural motivator for humans. Use of urgency and scarcity in subject line can increase open rates up to 22%. And adding urgency to email copy (“limited to 1,000 attendees”) increase click-through rate by 15%. You should realize the purpose of your email and what kind of action it should lead to. But at the same time in your emails you should not sound like a salesman. You should offer something useful to your recipients making it clear to them what kind of action you want them to take next. You should not be vague in your call to actions. Try to be as specific as possible. No one is interested in problems. So, you should give your recipients a good answer to the question “Why?” Why should they take the action you are asking them to take? Your email should be offering solutions instead of simply listing the problems or the issues. Thus don’t forget to address pain killers, payoffs, and incentives in your email copy. Specific subject lines are great for negative messages, because in this situation some extra ambiguity can make people really anxious. Vague subject lines work better for positive or neutral messages. Ask people to respond to your email whether they are interested or not. This could be a good ending of your email if you thank your responders for consideration and say that you are looking forward to their reply. Let your recipient know that you know that they are busy and because of this you are going to call them in a couple of days to follow up. This trick increases response rate, but don’t be sad if you get “not interested” message in reply. These “not interested” people save you a lot of time and energy. Before sending your emails check once again for grammar, spelling and punctuation errors. A badly written email with a lot of errors makes you look unprofessional and not worth responding to.